Dynasty's costumes are so iconic that they inspired a piece in The New York Times titled 'Never Mind the Catfights. What About the Clothes?' Joan Collins and Linda Evans' getup in the '80s show provided the starting point of Raquel Diniz's Fall '18 collection, after the designer watched a series of reruns. 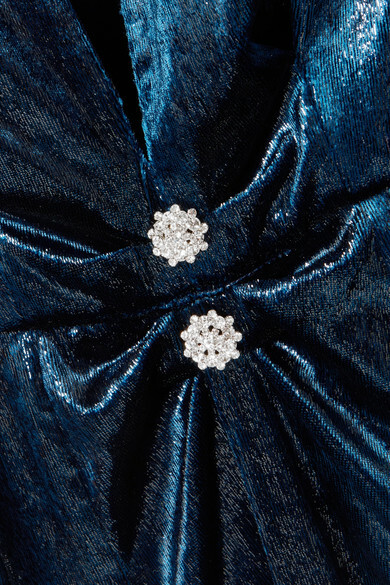 This 'Christy' dress has been made in Italy from shimmering velvet. Match your earrings to the crystal-embellished brooches, which rest on the flattering gathers beneath the plunging neckline. Shown here with: Givenchy Shoulder bag, Magda Butrym Mules, Kenneth Jay Lane Earrings.